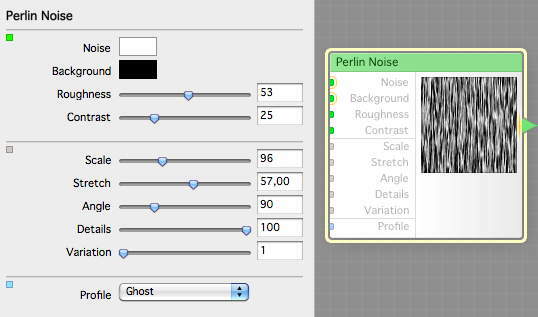 We start with a Perlin Noise this time, and set it up like this, connecting two Color inputs to it. You pick the woody colors you like. 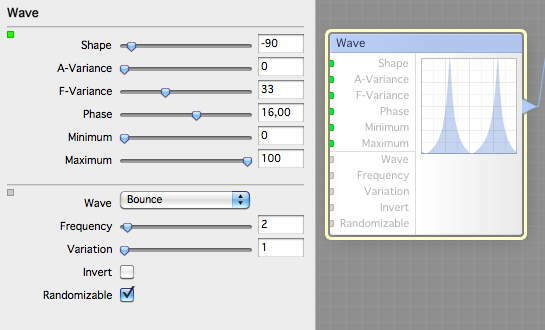 The we connect a Wave like this to the Profile input of the Perlin Noise. As you see the Wave is rough, I will soon tell you how this is made. Now we create a Cells and set up up like this, and connect it to the Maximum input of the Wave. 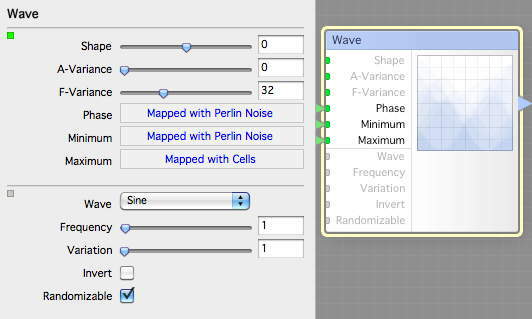 Then we create a Perlin Noise and connect that to the Phase input of the Wave. 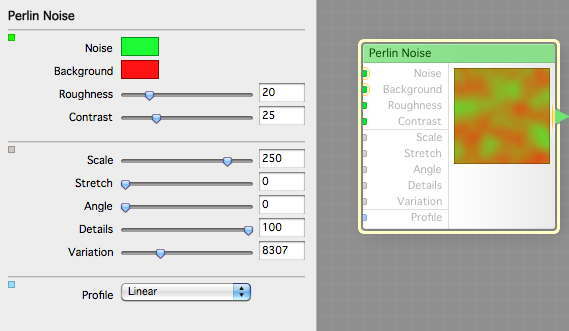 And at last another Perlin Noise that goes to the Minimum input that is setup like this. This will be wood base, but we need rings for this wood too. 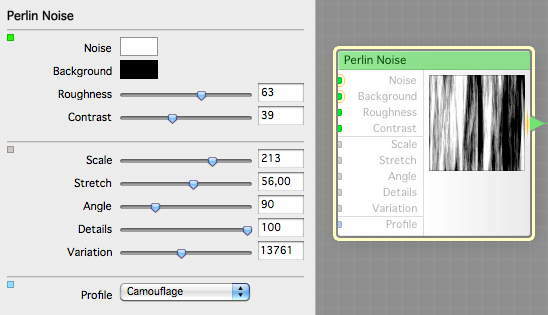 So we create another Perlin Noise setup like this, and add another color input. 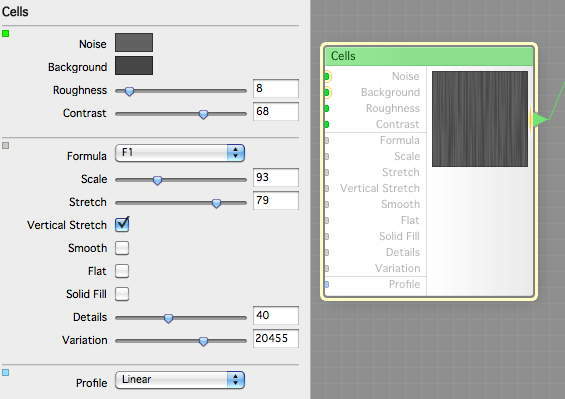 Now we create a Wave swtup like this and connect to the Profile input of the Perlin Noise. Then we connect that output to the Results component, which we setup as a surface. Now we start to work on the height map. We create a Cells setup like this. The we run it through a Round and a Desaturate, and connect the texture output we did before to the Granularity input of the Round. We make this the height for the Results component. 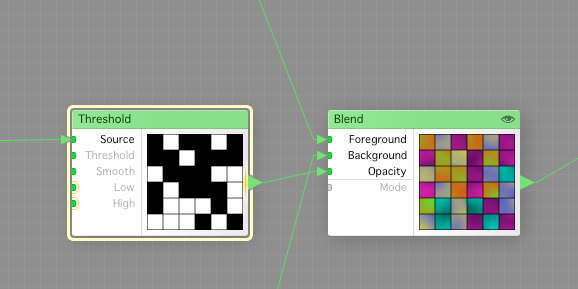 Now we create a Threshold component, ar set it like this. We take the output from the Desaturate as Source. 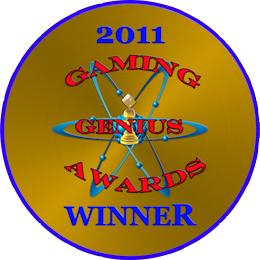 We input this to the Reflection of the Results component. So, how does it look? 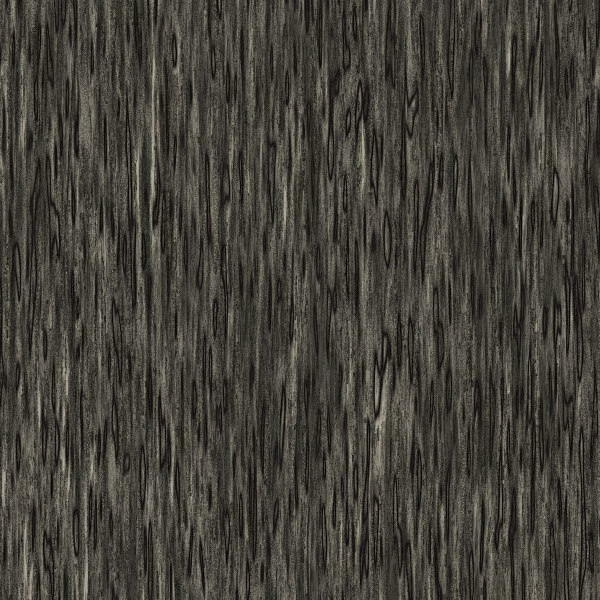 Here is an AO render of the texture. Remember that this is not wood you make fine furniture of, more like a worn plank. OK, shall we play with the tiles now? 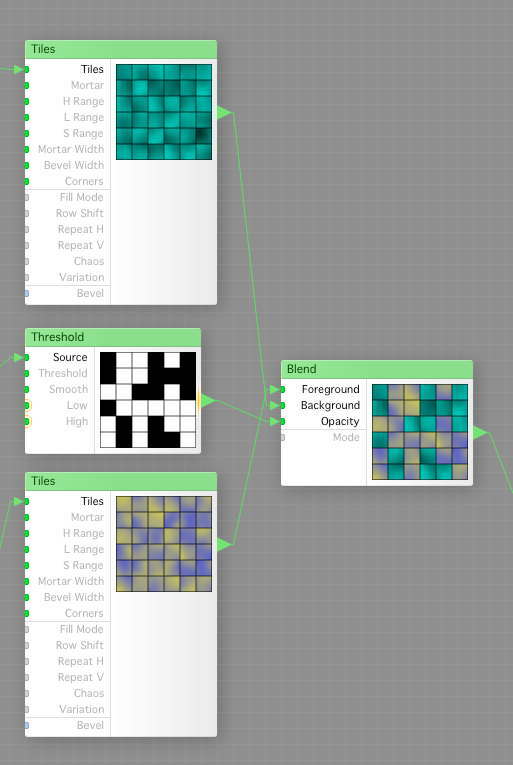 We create a Tiles component, set it up like this. The Variation should just be something random though. We now feed the output to a Threshold component. Now we make two more copies of this set, and set the Variation different in each. 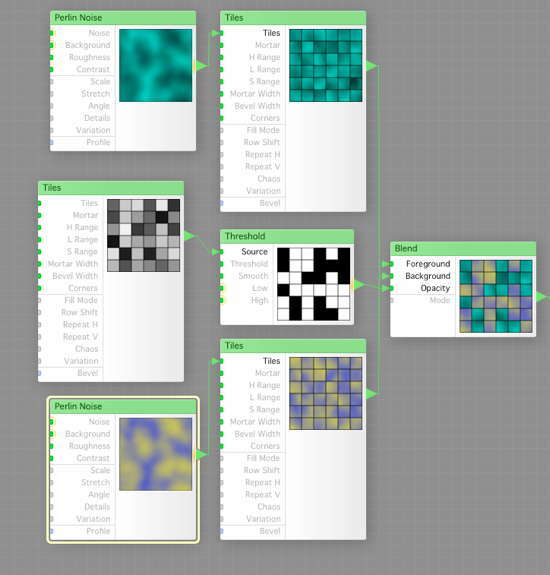 Then, as we need a texture, we create a Perlin Noise, with two colors, this is just for show, this is where we will use our Stone filters later when we make the real filter. 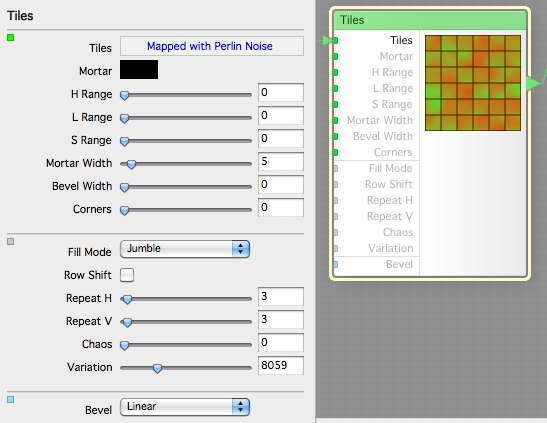 We then make a Tiles and feed the Perlin Noise to it. 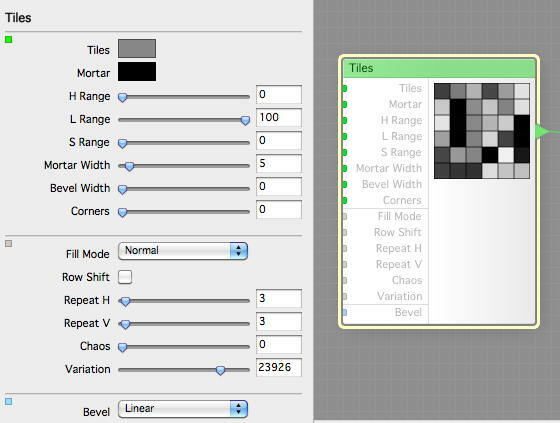 We make three more copies of this “set” too, and set different colors in the Perlin Noise. 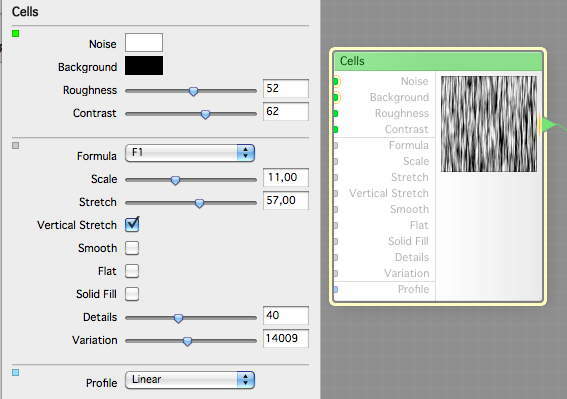 Then we can couple them together two by two using the Threshold output and Opacity using a Blend. And a closeup on the Threshold and Blend. Then finally put the two groups together, like this. Now we got a interesting result, we don’t have a height map yet so this is a simple Result. 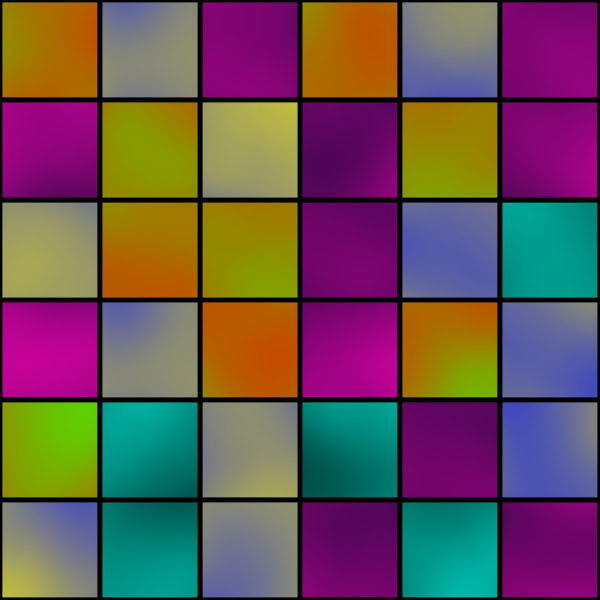 And here are the filters from todays tutorial to play with. I really hope you enjoy this.